This year’s NextFest in Los Angeles features more than 160 interactive exhibits – including our Cell Phone Disco! – from leading scientists and researchers around the world. Experience the future of communication, design, entertainment, exploration, health, play, robots, transportation, security, and green living. Visitors of all ages are welcome. 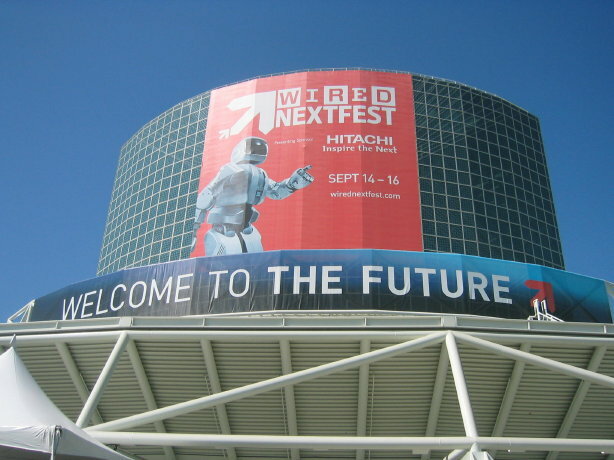 WIRED NextFest 2007 builds on the success of the previous three years, where the festival attracted more than 100,000 attendees combined in New York (2006), Chicago (2005) and San Francisco (2004). The event brings together innovations from inventors and research and development labs from around the world for both children and adults alike. Staged in thematic pavilions covering more than 150,000 square feet in the Los Angeles Convention Center, the exhibition will feature advancements in communication, design, entertainment, energy, the environment, exploration, medicine/health, robotics, security and transportation. “We’re taking the essence of WIRED and bringing it to life through interactive experiences and dynamic live demos that show the world is changing,” said Drew Schutte, publishing director of WIRED Media.